Slat chain conveyor is a common sight in food & beverage, cosmetics, detergent, pharmaceutical, packaging, automotive, electronics, textile, and many other industries. The customers are given choice of the length, width, structure and drive type of the conveyor. 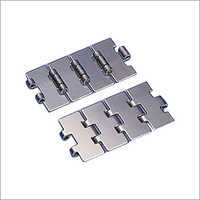 The belt material is slats, which are linked to each other with pins and a parallel chain is used to drive the interconnected slats. Made from steel, stainless steel or polymer, the design of the slat chain can be straight or radius. The slat chain conveyor is suitable for high impact and wear applications.